How secure is the Cocoa Mountain website? We will endeavour to despatch orders received before 9am the very same day ! Unless you request otherwise, we send all packages by Royal Mail First Class post, which we find to be the fastest and most reliable method. We offer shipment of our chocolates to specified EU countries for a small surcharge which will be calculated at the checkout. However, we do not recommend shipping our perishable products to warm countries. As we have no control the amount of time taken to delivery & over the temperature during transit and upon arrival abroad, we cannot accept responsibility for melted products if you choose to ship goods internationally. Should you require goods dispatched by fast courier please email us at info@cocoamountain.co.uk for pricing and confirmation. In the unlikely event that your payment card is used fraudulently to make a purchase with Cocoa Mountain Ltd, you the consumer, are entitled to cancel the said payment(s). If payment has already been made, you, the customer, are entitled in accordance with the standing Consumer Protection Distance Selling Regulation (2000), to a re-credit or to have all sums returned to you by the card issuer. The Cocoa Mountain CHOCOLATE BAR is located in the Balnakeil Craft Village , half a mile north-west of Durness - the most north-westerly village on mainland Scotland . Security is the main consideration for online purchasing which is why we take security very seriously at Cocoa Mountain. Whenever your personal information is sent to or from us we ensure that the information is sent securely using the latest SSL encryption (Secure Socket Layers). This means that the information cannot be intercepted and decrypted by anyone else - for tech-heads, we use a variable SSL encryption at 128 to 40 bit dependant on the browser capabilities. All of your orders and details are kept in a secure database on our webserver and can only be accessed by key members of the Cocoa Mountain staff and are not shared with anyone else. This is an unofficial reminder to you that you are in a secure area of the website, but the official confirmation can be found by looking for the locked padlock icon on the bottom right (Internet Explorer) or bottom left of your browser window. This shows that you are using secure encryption. If you double click on the padlock it will bring up more details about our security certificate including the encryption level and the fact that the certificate is in our name! If you wish to talk to a human being about anything relating to Cocoa Mountain Ltd or the website, or if you have any general queries you can phone us on +44(0)1971 511233. This is a standard rate line, so calls will not cost more than normal. Our offices are open from 9am-5pm (GMT) Monday to Friday except for bank holidays, but you can send us an email to info@cocoamountain.co.uk at any time and we will respond as quickly as possible - we have a skeleton staff monitoring emails when we the offices are closed. Your details are held by Cocoa Mountain and are never shared with other organisations. The personal information which we hold will be held securely in accordance with our internal security policy, the law and the Which? Web Trader Code. Whilst we may e-mail you using your supplied e-mail address for queries about your orders or for order confirmation, we will not e-mail you in the future unless you have given us your consent. When you register there is an option to choose to not receive any marketing e-mails from us, and if you change your mind at any point you can change your preference either way simply by logging in to your account and editing your details or you can e-mail or telephone us on +44(0)1971 511233 and we can change it for you. Cocoa Mountain Ltd and its affiliates provide this site to you subject to the following terms and conditions. Please read the terms and conditions carefully as if you visit our site or shop at www.cocoamountain.co.uk you are deemed to have accepted them. Please leave the site if you do not. The contents of this web site (including all web site design, text, graphics, the selection and arrangement thereof and all software compilations, underlying source code, software and all other material) are copyright Cocoa Mountain Ltd or its content and technology providers except in so far as individually stated on particular material or items. You may view the site and download any part(s) of it to a personal computer for personal viewing for private purposes only but you are not permitted without our permission: (a) to store it or any part of it other than for the purposes set out in this paragraph; (b) to print out copies except for your own viewing for private purposes; or (c) to reproduce, copy or transmit it (or any part of it) in any other way for any purpose or in any other medium. You are also not entitled to alter the content in any way. Links to other sites are made at your own risk and Cocoa Mountain accepts no liability for any linked sites. When you access a non-Cocoa Mountain web site, please understand that it is independent from Cocoa Mountain Ltd and Cocoa Mountain Ltd has no control over the content of that web site. Further, a link to a non-Cocoa Mountain web site does not mean that Cocoa Mountain endorses or accepts any responsibility for the content or the use of such web site. Users must take their own precautions to ensure what is selected for use is free of such items as viruses, worms, trojan horses and other items of a destructive nature. Users of this site may post or submit news, comments and other content, submit suggestions, ideas, questions or other information so long as the content isn't illegal, obscene, objectionable, threatening, defamatory, and doesn't invade anyone's privacy or infringe intellectual property rights or otherwise injure third parties in any way. To avoid any doubt, unauthorised advertising in any form of a business, product or service or any other matter on this site is strictly prohibited and any postings deemed by Cocoa Mountain to be advertising may be immediately removed . You may not use a false e-mail address, impersonate any person or entity, or otherwise mislead as to the origin of any of the content posted to the visitors' book on this site. The views, opinions and comments and other material of users who have contributed to the visitors book are his or her personal views only and do not represent the views of Cocoa Mountain Ltd. By posting to this visitor's book you grant Cocoa Mountain Ltd a non-exclusive, royalty free, perpetual and fully sub-licensable right to use, reproduce, modify, adapt, publish, distribute, display and delete the posting without requiring further permission from you. Cocoa Mountain do not edit postings and are not responsible for the content of posted content or images of any nature. Postings may be removed by Cocoa Mountain at any time at its sole discretion. If you believe that common standards of Netiquette have been violated, or that a posting or message violates your copyright in a work, please let us know at info@cocoamountain.co.uk. In no event shall Cocoa Mountain Ltd be liable to you or to anyone else for any damages of any kind, including but not limited to, compensatory damages, lost profits, lost data or any form of special, incidental, indirect, consequential or punitive damages of any kind however arising (including but not limited to claims under delict or tort (including negligence), defamation, infringement, obscenity, invasion of privacy or otherwise) even if Cocoa Mountain is informed in advance of the possibility of this. Information may be changed or updated on this web site without notice. Cocoa Mountain Ltd may also make improvements and/or changes in the products and/or services described in this information at any time without notice. Cocoa Mountain Ltd and the hosts of this site accept no responsibility for and exclude all liability in connection with browsing this site, use of information on this site and downloading any material from it including but not limited to any liability for errors, inaccuracies, omissions or misleading or defamatory statements. Whilst we hope you find the content on our website interesting the content is for general information only. No warranty is given regarding the accuracy, currency or applicability of any of the content in relation to specific situations or particular circumstances. 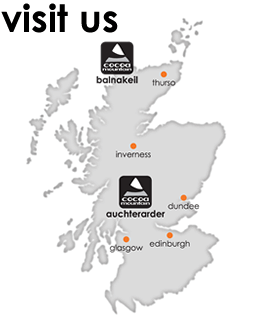 Cocoa Mountain Ltd is a privately owned and operated Scottish company. We currently run our online shop at www.cocoamountain.co.uk. Cocoa Mountain Ltd endeavours to produce the freshest hand crafted chocolates and truffles. Thus as a result, we aim to deliver the best possible customer experience, and we therefore adhere to and if possible exceed, all current and proposed legislation in addition to trade body guidelines. The conditions detailed below do not affect your statutory rights according to United Kingdom law. When shopping with Cocoa Mountain , you can be assured of complete peace of mind. You may cancel your order at any time, up until 12 noon on the day previous to that which you have requested that it is despatched. In the event that you wish to cancel your order, please contact us on 01971 511233. Please be aware that you will be liable for any postage costs incurred as a result of returning items to Cocoa Mountain and you should ensure that you obtain proof of postage as you send it back. We regret that a refund can only be provided for items received back by us. This does not affect your statutory rights. All our chocolate gifts are despatched in perfect condition, as we take the utmost care in wrapping them. If any items are unfortunately damaged in transit by circumstances out with our control, you can return them to us at the address above. Once we have received the item, we will refund the full purchase cost of that item or send out a replacement by return & refund reasonable postage costs incurred. We can include a special handwritten message with your gift. This will be reproduced as you type it, directly onto the message card.